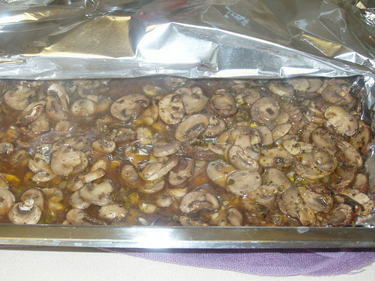 Roasted Mushrooms - Now What? - mmm-yoso!!! Roasted Mushrooms - Now What? I've decided to actually do some cooking during the upcoming week. Problem is, I'm not quite sure what to make? So while aimlessly wandering down the isles of Trader Joe's I grabbed a couple of packages of sliced mushrooms. I usually purchase whole mushrooms and slice them myself, but I had decided to make roasted mushrooms, so the pre-sliced crimini and white mushrooms would do. Whenever I really can't figure what to do I'll go for one of my "ingredients". These roasted mushrooms can be used many ways, for pasta sauces, they can be pureed and used as a thickener for soups, as sandwich topping (ice cream topping?? ?, guess not), and dips. Any type of mushroom can be used, I've used enoki's, portabellos, shiitakes, oyster( be sure to remove stems, need to be careful with these they tend to liquidize). I decided to go with plain buttons and crimini's. I think the recipe is originally from Charlie Trotter - I don't have the original, but as with most recipes, I made adjustments to accommodate my taste, and have added ingredients (soy sauce, red wine) as well. Place all ingredients in a baking pan, mix together, cover well, and roast at 325 degrees for 45 minutes. Cool in liquid and refrigerate, mushrooms will last up to 1 week in a covered container. Oh my gosh Kirk! I suggest an omlette! Sautee thinly sliced onion in olive oil till just transparant, toss in a bunch of fresh chopped parsley at the end then put in a bowl & set aside. Do your eggs, get them in the pan, top half with a small amount of grated cheese, equal parts jack & sharp cheddar is what I like best but some emmenthaler or decent swiss is excellent as well. Roast a chicken that you've brined with wine, rosemary, and lemon. Rub the skin with lots of black pepper and do it for a couple hours in a slow oven. Pull the meat from the bones & smother it with the mushrooms. Serve with jasmine rice and fried cabbage. Jo - Ha! You've just got this endless stream of ideas don't you....well let's see what I can pull off. I assure you it won't be quite as good as your ideas! Mainly cause I'm lazy! I'll eat a mushroom every now and again, but I can't say that they are favorites of mine. If I do eat mushrooms, they are usually shiitakes and they are used in stewed dishes. Can't wait to see what you have in store for these. Reid - Well I've started using some on top of my beef tenderloin sandwiches, and have already made some pasta...it'll keep for a while so I can kinda go crazy and dump it, or the "liquor" everywhere.